The Installation Management Academy, School for Family and MWR proudly announces the release of the online NAF Contracting Officer’s Representative Basic Training Course; now available in our Learning Management System (LMS). This mobile-friendly course will be available to all DoD NAF employees. This course includes a pretest which learners are required to pass with 100% in order to gain a certificate (*). The course is approximately eight (8) hours in duration. This course will fulfill the COR Level I – 8 hour training requirement of “at least every 3 years” per the DODI 410567, dated April 7, 2016. There may be additional training requirements identified by the Contracting Officer and included in the COR appointment letter at the time of award. 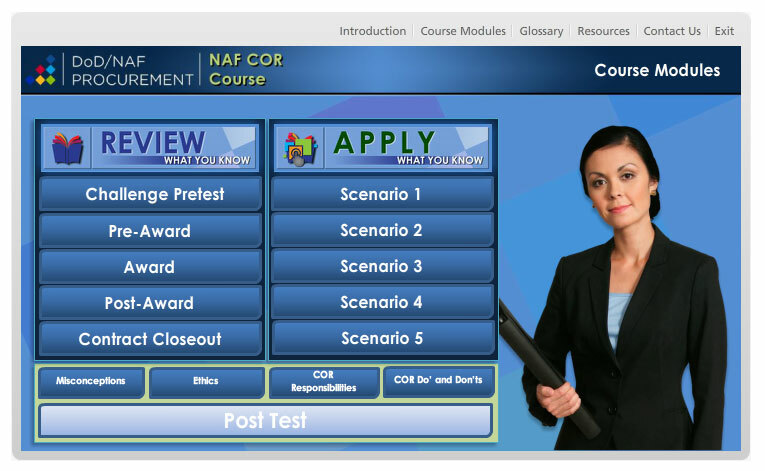 The “NAF COR Requirements and Guidance” provides additional information pertaining to COR Level I, II, and III training requirements dictated by contract complexity. (*) Learners who pass the pretest will earn full credit for the course without reviewing course content. Those who did not pass the pretest will have an opportunity to review course content and take the posttest.